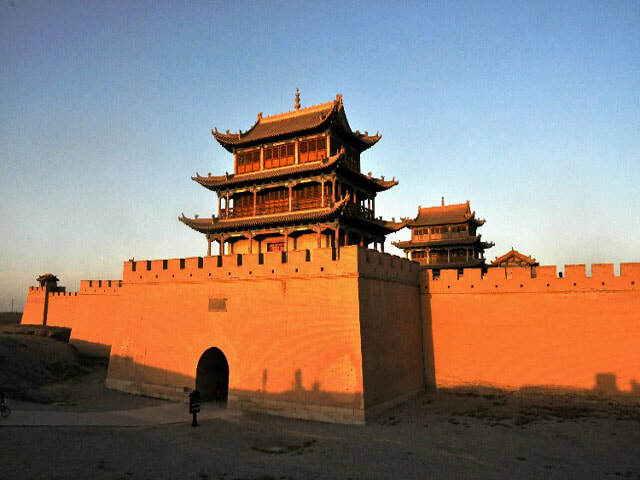 Originally built in 1372, Great Wall at Jiayuguan Pass is situated in the southwest of Jiayuguan City. It covers an area of 33.500 square meters. The Great Wall is located in the middle of the narrowest valley in Jiayuguan. The city wall is 733 meters long and 11.7 meters tall. It consists of: Inner City, a barbican entrance to the city, the wall built around the city wall, moats and three three three-story high-rise towers and watchtowers. The Great Wall at Jiayuguan Pass is centered on the Inner City with an area of 2.5 hectares. The Inner City is surrounded by a barbican entrance facing the south. You will find the walls built around the west barbican entrances in the Inner City. You can explore the old buildings at the Great Wall at Jiayuguan Pass such as the General's Office, Guandi Temple, the theater stage and Wenchang Pavilion. In the afternoon, you will be amazed at the stunning sunset at the Great Wall. If interested, you could visit the Great Wall Museum close to the Great Wall at Jiayuguan Pass to get more information on the Great Wall. If you are planning to visit Great Wall at Jiayuguan Pass for photography purposes, the best time to visit is during the sunset. If you would like to explore the Great Wall for its history and culture, it is suggested that you visit it during the opening hours. The best hours to visit are from April to October. There are only a few buses passing by the Great Wall at Jiayuguan Pass. Therefore, there are only a few options. Rent a vehicle to the Great Wall from Jiayuguan City. This is the quickest and most direct option. Take Bus 4 to the Stop of Guancheng Scenic Area (关城风景区站). Take Bus 6 to the Stop of Guancheng Tourist Scenic Area (关城旅游风景区站). Please check out the weather forecast beforehand as sometimes the sand storm comes by Jiayuguan City. Please take body lotion, lip balm, and hand cream as it is always dry in Jiayuguan. Interested in visiting the Great Wall at Jiayuguan Pass on a Tour? Wendy Wei Tours offers a variety of different packaged tours as well as custom tours including the Great Wall at Jiayuguan Pass, among other attractions and destinations. To find out more, please visit our Tours page or Contact Us directly to find out more.